Our day starts with care! We are more than just a senior living care, we are a family that cares. TOUCH of CARE senior living provides services in a supervised residential care setting for adults requiring assistance in their day-to-day living in order to enhance the quality of life, improve the level of independence, achieve the highest functional performance, and promote the personal dignity of each resident while delivering supportive care services in a safe environment. Touch of Care is duly licensed under the rules of Adult Foster Care in Oakland County, Michigan and owned by experienced medical professionals. We provide care services for ambulatory as well as non- ambulatory adults who need various levels of assistance with their personal care and activities of daily living as a consequence of diseases, injuries, aging, and age-related disorders like dementia and Alzheimer’s disease. "A touching short video about fatherly love and forgetfulness"
Touch of Care Senior Living is one of the recipients of the Best Senior Living Awards by SeniorAdvisor.com for Senior Care Providers in North America. 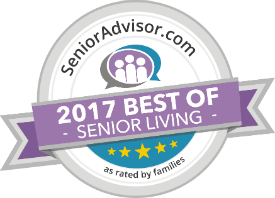 The awards celebrate the communities and agencies that have received outstanding feedback from their families on SeniorAdvisor.com. The award recognized the top 1 percent of senior care providers according to customers for assisted living, in-home care, and other senior housing providers across the United States and Canada. The facility has a homelike setting, maximizing independence and an accessible living environment. It has an open, spacious set up designed to accommodate residents with different degree of physical impairments or memory deficits with fear of being closed-in or claustrophobic. The physical environment allows freedom of movement for the residents between common areas and their rooms. The common areas have comfortable and non-institutional set-up. It has numerous windows which provides residents diverse views of the outdoors with beautifully manicured landscaping and garden areas to allay or lessen the perception of confinement and to promote visual stimulation. The environment has visual contrasts between floors and walls with non-reflective floors, walls, and ceilings with adequate lighting. We offer fixed fees with no hidden charges. Copyright © 2016.Touch Of Care Senior Living & Placement Services. All Rights Reserved.